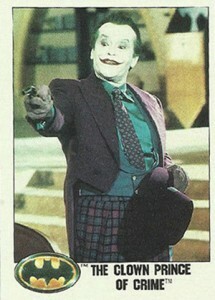 Today, 1989 Topps Batman Movie trading cards are a nice and affordable collectible surrounding one of the most popular and influential super hero movies of all-time. While they're easy to come by thanks to the period in which they were produced, it doesn't take away from the product's depth. 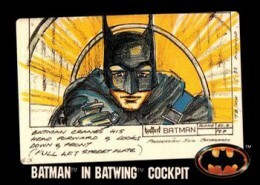 Spanning two series, 1989 Topps Batman Movie cards cover both the action in front of the camera and behind it. 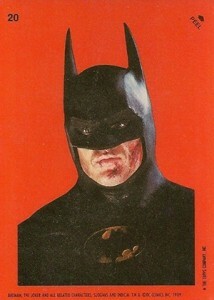 1989 Topps Batman Movie Series 1 and Series 2 are split evenly. Both releases have 132 base cards plus 22 stickers, making a full set 264 cards and 44 stickers. All take a simple approach to design. 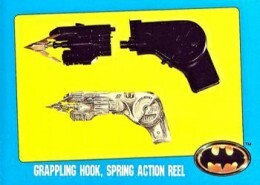 Fronts have a large image (or a split of two smaller shots) that is complimented by a plain frame, and the Batman logo and a caption along the bottom. Series 1 cards have a white border while Series 2 are yellow. Much of the backside is covered with the Batman logo. There's a small writeup and a call to action to check out the next card. 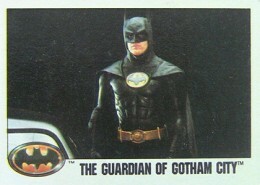 Unlike a lot of Topps sticker sets from the 1970s and '80s, 1989 Topps Batman Movie Stickers aren't die-cut. Like the base cards, background colors differentiate the two series. The first 22 stickers are red while Series 2 are white. Backs have puzzle pieces. Both series were offered in Collectors' Edition factory sets. In addition to the base cards and stickers, each also has 11 exclusive Bonus Cards not available in packs. Also, cards from these sets come with a glossy finish. For sports card collectors, they're similar in quality to Topps Tiffany cards. And while the Collectors' Edition sets may claim to be "Limited Edition," they're still extremely plentiful today. Back in 1989, virtually every trading card product was made in massive quantities. 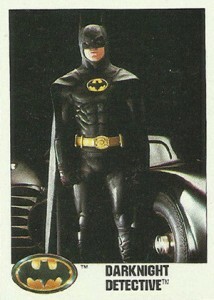 1989 Topps Batman Movie cards are no exception. The film was a massive blockbuster and a marketing machine. This means that the cards are readily available and at reasonable prices. PARALLEL CARDS: Glossy - Included in Collectors' Edition factory sets. 21 Knox on the Job! 32 Holding Batman at Bay! 34 Jack Loses His Grip! 35 Plunge into Toxic Oblivion! 37 Spotted by Commissioner Gordon! 42 Call Me ... Joker! 44 Wait'll They Get a Load of Me! 51 "I'm in Charge Now!" 55 The Mime of Mayhem! 56 Funny Meeting You Here! 59 Who's the Wildest One of All? 62 Keep Up the Bad Work! 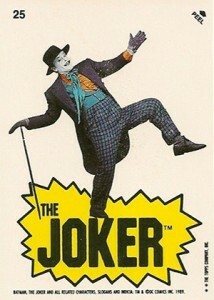 64 The Joker Conquers TV! 72 No! No! I'm Melting!! 79 The Batmobile Tears Away! 82 How Much Do You Weigh? 90 Friend ... Or Mad Vigilated? 92 Vicki in a Jam! 93 The Joker Is Wild! 100 Escape from Flaming Death! 107 Taking Aim at the Batwing! 110 Vicki to the Rescue! 115 Watch Out Behind You ...! 121 No Match for Batman! 122 Bruised But Not Beaten! 129 The Joker--Over the Edge! 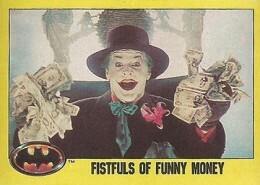 137 Fistfuls of Funny Money! 140 Time to Die, Grissom! 148 You Know Who I Mean...! 153 News of the Battle! 159 Hanging On For Life! 187 The Field Flies High! 191 A New Mad Plan! 209 Goons in Hot Pursuit! 213 Who Is Jack Napier? 220 The Night Is His Again! 223 Everyone Needs a Hobby! 264 The Killer Clown's in Town! 44 cards. Inserted one per pack. Series 1 - #1-22, Series 2 - #23-44. Series 1 Stickers have a red background. Series 2 have a white background. 22 cards. Series 1 - #A-K, Series 2 - #L-V. Exclusive to Collectors' Edition factory sets. Shop for Collectors' Edition sets on eBay. Where is the best place to find value on cards? I have a friend that has a lot of cards he wants to appraise, just not sure where to look. I have several sets of batman 1 and need an itemized list of each set I.e. small UK, Europe set. Thanks. All of my Series 1 Stickers have different numbers, for example the Sticker labeled 1 (Batman) on this list is labeled 133 on mine; furthermore there is no Peel label on mine either but everything else looks the same front and back. Any ideas? Topps Batman Trading Cards 36 Pack Box 2nd Series 1989, Unopened!